Windows 10 was released on July 29 and I was one of the millions who upgraded my PCs right away. I had been running the preview builds for a few months on a test machine as one of Microsoft’s five million or so Windows Insiders, so I knew more or less what to expect. After running Windows 10 for ten days on my main PCs, I’ve found some things I like and some that I don’t. The upgrade process was smooth, Cortana and Continuum are great new features, but Edge is disappointing and OneDrive integration could be improved. Here are my thoughts. If you’re running Windows 7 or Windows 8 and have all the latest service packs installed, you can upgrade to Windows 10 for free until July 29, 2016. So should you upgrade and if so, when? I don’t think there’s any compelling reason to stay on Windows 7 or 8. The design philosophy for Windows 10 seems to have been to combine the best of both its predecessors and for the most part, I think they have succeeded. If you avoided Windows 8 because it took away the Start Menu, you’ll be happy to hear it has returned for Windows 10. And likewise if you enjoyed the touch features of Windows 8, I think you’ll find the approach that Windows 10 takes is familiar, if a little incomplete. Users of both Windows 7 and Windows 8 should feel right at home in Windows 10. It’s new, but it’s still Windows. If you reserved your upgrade then it’s probably best to wait until you’re notified that the upgrade is ready. That way you can be sure that drivers and other aspects of your computer will continue working properly after the upgrade. If you’re a little more adventurous, you can of course go ahead and upgrade now using this tool. I got the notification to upgrade right away on one of my PCs and of course went about manually upgrading the rest of them. The only problem I ran into was on my Surface Pro 3, because I had VPN software installed. The good news is that it takes just a couple of clicks and a few minutes to go back to your previous OS, which I ended up doing a few times while troubleshooting. It’s incredibly comforting to know that you can revert back to exactly the way things were before if the upgrade doesn’t go well. Windows Central has a solid roundup of other upgrade issues you may encounter and how to resolve them. 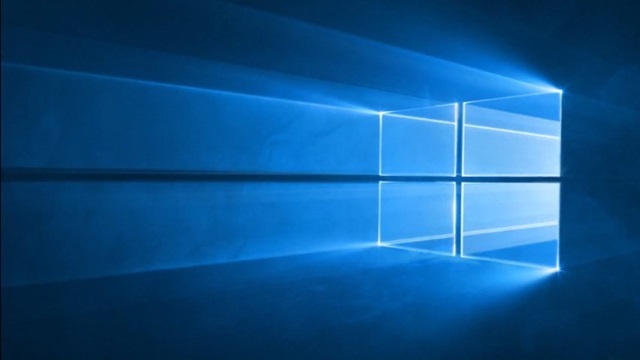 You should note that not all Windows 7 PCs will be upgradable to Windows 10. They still need to meet the minimum requirements. I tried to upgrade my old Toshiba Portege M200 for example, but of course it didn’t work because just like Windows 8, the PAE, NX, and SSE2 processor features are required for Windows 10. So if you have really old hardware, don’t be surprised if it won’t upgrade. Anything in the last five years should be fine though. 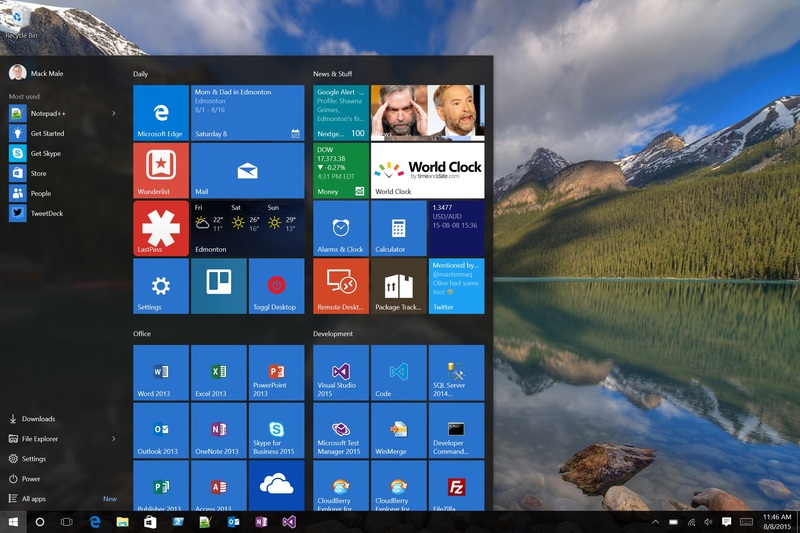 As mentioned, the start menu is back in Windows 10. When you turn your PC on, you’re presented with your desktop rather than the start screen that appeared in Windows 8.1. And when you click the Start button, you now get a more or less familiar looking menu. There’s “all apps” from Windows 7 and also tiles from Windows 8. You can resize the start menu to be skinny like Windows 7 or to take up more of the screen, similar to Windows 8. 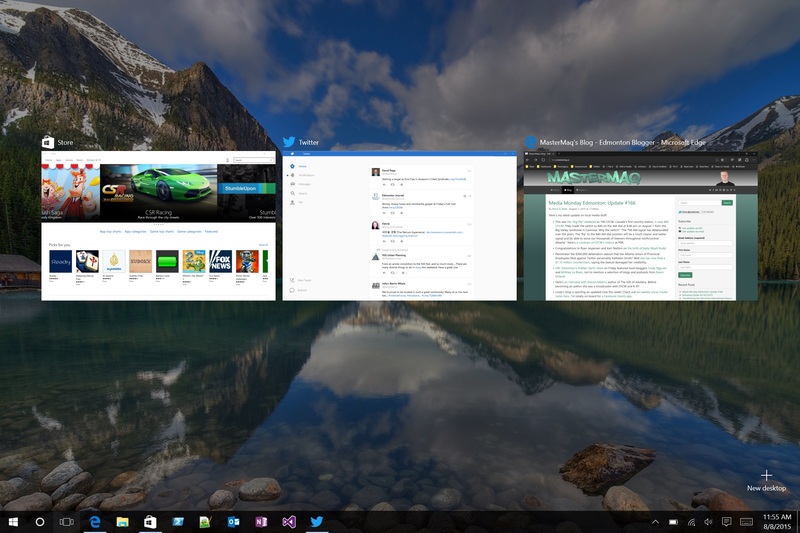 I like the live tiles, so I have made the start menu on my desktop PC three groups wide. On my Surfaces, where there is less space available, I’ve shrunk this down. If you had groups of live tiles in Windows 8.1 those will be combined into a single group in Windows 10, so you need to reorganize them again. It’s annoying but only takes a few minutes. My main complaint about the new start menu is the wasted space on the left. It doesn’t seem like “Most used” is actually accurate and there’s an awful lot of blank space between that and the primary commands at the bottom (because I have resized the menu to be taller). It feels like the perfect spot to let me pin a few more things. I wish the tiles for desktop apps looked better too. On the plus side, opening apps is done the same way it has been since Windows 7: simply press the Windows key, start typing, and hit enter. Windows 7 worked on touch-enabled devices, but it was horrible to use because everything was designed for mouse users. Windows 8 focused on making the touch experience great, but many feel that negatively impacted mouse and keyboard usability. Windows 10 tries to find the middle ground. The new thing is called Tablet Mode, or Continuum as it also known. If you’re on a touch-enabled device, you can turn on Tablet Mode which expands the start menu to take up the entire screen (kind of like on Windows 8.1), opens apps in full screen mode, and adds a handy back button to the taskbar. When you swipe in from the left, you get the new Task View, which lets you pick from the running apps. And of course the on-screen keyboard pops up as appropriate in this mode. The other big change is that you can swipe an app down from the top to close it, just as you did with Metro apps on Windows 8. On devices like the Surface that have a detachable keyboard, you’re prompted to switch in and out of Tablet Mode when you disconnect or reconnect the keyboard. By default Windows will ask you every time but you can tell it to remember your selection too. You can see a video of how this works here. After using Tablet Mode for a while, I’m finding I like it a lot more than I thought I would. It’s a really great experience on my Surface Pro 3 and I don’t mind the prompt to switch modes at all. The marketing speak is that it “puts you in control” but I’m finding that to be true, sometimes I want one mode and sometimes I want the other mode and I get to pick when. One of the compelling new features of Windows 10 is Cortana. I’ve been using Cortana on my Windows Phone for a while now and was eagerly awaiting a version on my PCs. Unfortunately Cortana is not yet available in Canada, though Microsoft has promised that’ll happen before the end of the year. If you want to use Cortana now, you can change your region to be the US instead of Canada. The only downside I have found to this is that the Calendar app will display temperatures in Fahrenheit instead of Celsius (the Weather app let’s you choose and the News app still lets you pick Canada as your region). 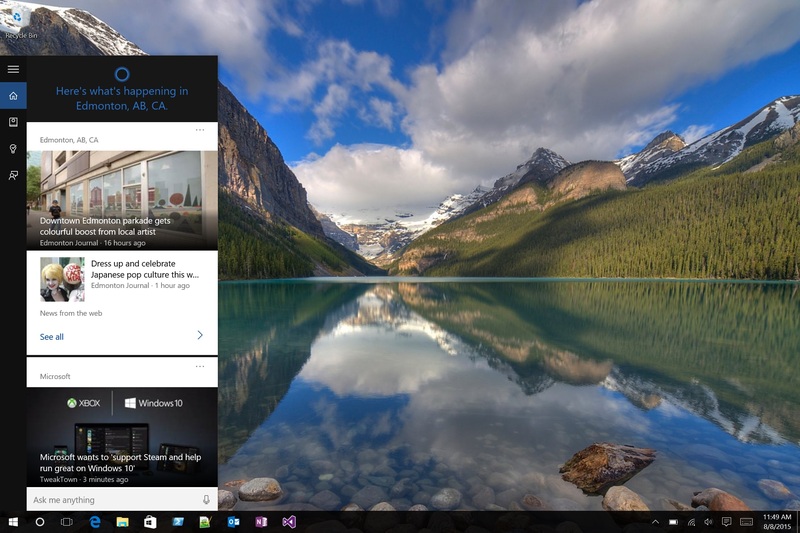 I’m a big fan of Cortana and the Windows 10 implementation is off to a great start. You can enable an active listening mode so that simply saying “hey Cortana” engages the assistant, or you can simply click the button. Cortana will surface your calendar, news related to your interests, weather, stock prices, and much more. I’ve found the speech recognition to be surprisingly good and am thrilled that Cortana does an increasingly useful list of things, like converting measurements. For anything else, you’ll get kicked out to Bing. Probably the most useful aspect of Cortana is reminders. You can set reminders by time, place, or person (“remind me to tell Mike congrats when I speak to him next”). It’s very handy to be able to quickly ask Cortana to remind me about something. Unfortunately, reminders don’t currently sync from Windows 10 to Windows Phone 8.1, but that problem will go away as soon as Windows 10 Mobile is released in the fall. I really like the direction Microsoft is going with Cortana. One of the biggest differences between Windows 8.1 and Windows 10 is in how OneDrive is handled. In 8.1 we had placeholder files, so you could open up your OneDrive folder and see all of the files there even though they weren’t actually there. If you tried to open one, Windows would magically download the file then launch the correct application. It was pretty handy, because on devices with limited disk space you could see everything without wasting gigabytes of space. Well in Windows 10 none of that works. Now you have to select which folders you want to sync, and after you’re done choosing, OneDrive does a more traditional sync where the files actually exist on disk. But if you have folders you haven’t chosen to sync, you won’t see those unless you go to OneDrive on the web as there’s no longer a OneDrive app either. For the most part, this hasn’t bothered me too much. There are some folders that I use all the time so I set them to sync, and others that I use almost exclusively as cloud storage, so I don’t need those on my PCs. Depending on how you have your files organized, this may or may not be an issue. I hope there are improvements on the way though, because it would be nice to have an app again to manage all my files without necessarily syncing them. The other point to make here is that if you use Office, the placeholders were always unnecessary and so your experience in Windows 10 shouldn’t change much. You can simply open Word, Excel, or PowerPoint and choose your OneDrive files from there without syncing. Same goes for OneNote, it loads your notebooks from OneDrive automatically. While Windows 10 does ship with Internet Explorer 11, the default browser is a new one called Edge. In theory it is a faster, slimmer, more compliant browser without all of the legacy cruft that IE carried. And while it is those things, it lacks key features right now that make it feel like a step backward in many ways. Let’s start with the things I like. The minimalist interface is great, and I love that there’s an option for a dark theme. I like the integrated reading mode and reading list features. The ability to draw all over a web page and send it to others is also extremely handy as a Surface Pro 3 user. I’m also optimistic about Cortana integration. And…that’s about it. 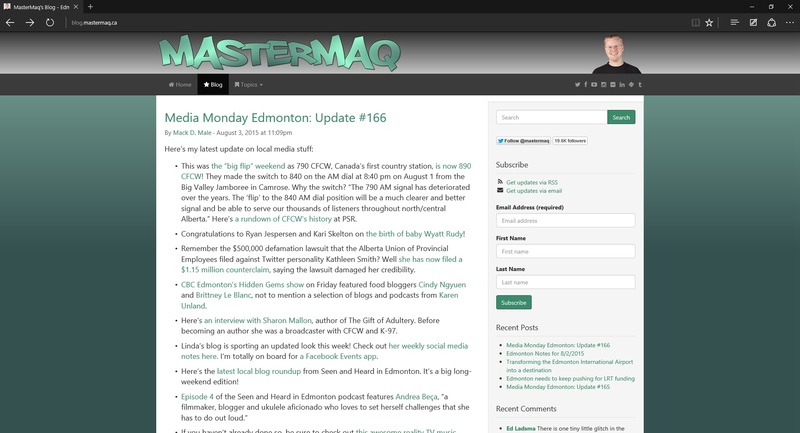 Yes, it renders web pages correctly. But that’s its primary and most important job so I don’t count that as a positive. There are many, many issues with Edge right now. Simple things like the fact that it won’t remember window locations (so if I open it up, move it to my second monitor, close it, and then open it again, it appears back on my first monitor). More significant things like the fact that back and forward gestures are gone from touch devices, something that made Metro IE a joy to use. Favorites do not sync between PCs like they did with IE. When loading pages in many cases scrolling doesn’t work until the entire page has loaded, which makes it feel frozen or slow. There’s no ability to choose where to save a download, nor is there a proper download manager that will continue when the browser is closed. Actually you can’t even choose whether or not to start a download, if you click a link to a file it just downloads it. You can’t hold the back button down to access recent history. There are no jumplist options, so you can’t right-click on the taskbar icon and start an InPrivate window, for instance. The list goes on, as you’ll see in the Windows Feedback app. Edge is half-baked at best. I want to like Edge, but it’s just not there yet. Hopefully some of these shortcomings are addressed in an upcoming update. And I know Microsoft has already said that some features would be coming in the fall, like support for extensions. I’m using it day-to-day for now, but if it doesn’t improve quickly I may have to switch. Also: I think it’s pretty ridiculous how many “reviews” of Edge I have seen that are positive, apparently just because the reviewer has some hate for IE. Have you actually used IE11? It’s a good browser. Dark theme. I like that Windows 10 by default has a dark look to it, and I hope that this is expanded on in the future. You can of course change the color to suit your mood. Task View (WIN+TAB) I know that OS X users won’t be impressed as they’ve had Mission Control (Expose) for a while now, but the new Task View is fantastic. You can still Alt-Tab of course to get to your apps as you always have, but Task View is critical for touch devices and works well. Multiple desktops. I guess this is a bit of a power user feature, but having the ability to turn on multiple desktops baked into Windows is a win. I can keep my email, notes, and other productivity stuff on one desktop and my development apps on another. You can switch between them using Task View, or by pressing WIN+CRTL+(RIGHT/LEFT). Feedback app. Have a problem? Don’t like something? Fire up the Windows Feedback app and see if someone has already reported it. You can upvote things or you can submit your own feedback. Hopefully Microsoft acts on all this feedback quickly. Groove Music. It’s basically the same as the old Xbox Music app, but with a new name (which I like) that hopefully means it can stand on its own (this is a good sign). Too much white. There’s no contrast anymore! File Explorer is blindingly white for instance, and most Win32 apps now have all-white title bars and menu structures. Some color would be much appreciated. Lack of features in Mail. It’s inexcusable that with an apparent focus on keyboard and mouse users, the Mail app in Windows 10 doesn’t let you select multiple messages using CRTL+SHIFT+ARROW like pretty much every other app in history does. There’s a long list of other limitations too (switching between accounts feels half-baked, for instance). Outlook, it is not. Battery life. I haven’t measured it, but anecdotally the battery life on my Surface Pro 3 seems to be maybe slightly less than it was with Windows 8.1. But on my original Surface Pro, it’s abysmal. There’s definitely room for improvement. Volume mixer still needs work. I was really hoping for change here, but no such luck. Some apps have individual volume controls, but others (like Songza) do not. It’s annoying. I want better control over this! Minor bugs. There are still little annoying bugs all over the place. On my desktop, choosing what apps to show on the lock screen doesn’t work. On my Surface, the Mail live tile never seems to update. Once or twice in tablet mode Windows has seemed to get stuck in right-click mode, requiring a logoff to fix. That kind of thing. If you’re concerned, wait til the fall when I’m sure these and other issues will have been largely addressed. 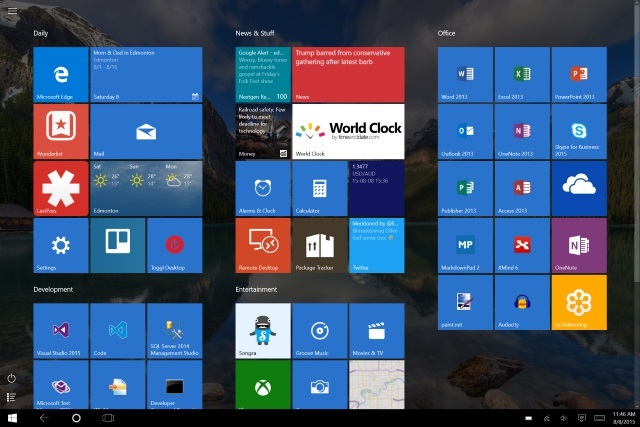 Windows 10 is not just a desktop OS, it will also run on a variety of other devices. The user interfaces may look different, but the core is the same as are the services that run atop the OS. By the end of the year, Windows 10 variants will be released for the Xbox One and for Windows Phone devices. I’m very much looking forward to Cortana on my Xbox, not to mention an update to my Lumia to better align it with my PC. Yes I have a slight bias toward Microsoft products, but Windows 10 has still impressed me, and it’s only going to get better from here. I absolutely think you should upgrade!